1. Schedule a FREE, no-obligation in-home consultation. To schedule your appointment, call 855-755-9092 or save an additional $100 by scheduling your appointment using our online scheduler! We offer convenient appointment times to meet your needs. 2. Visit one of our showrooms. Simply bring your room measurements and photos of the area(s) to one of our showrooms where a representative will provide you with an on-the-spot estimate. 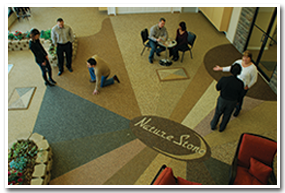 The only way to know the final cost of your NATURE STONE® Brand Flooring and installation is to receive a customized proposal from one of our professional representatives. An on-site inspection is critical to determining the condition of your existing concrete. Stone and epoxy flooring should not be used to cover severely damaged, shifting or structurally unstable concrete. This should be disclosed at the time of the site inspection and cost estimate. NATURE STONE flooring is not intended to build up sunken concrete areas to redirect water away from the home. It is a porous product designed to allow water to pass through it. A physical site inspection can address these types of issues and concerns. The amount of prep work required for the existing concrete will need to be determined. This is critical to a proper installation. Such preparation may include light grinding of the concrete, pressure washing or removal of carpet, tile, paint or other coatings and sealers. The proper bond to the concrete is the most important step. The type and number of expansion and control joints will need to be determined at the time of the inspection. Covering those joints (especially outdoor) is risky. If the concrete “moves,” as designed, then the same movement can crack the stone and epoxy flooring. NATURE STONE offers a special expansion strip that “bridges” over the existing joints and dramatically reduces the potential for cracking. SCHEDULE ONLINE TODAY OR CALL 855-758-9092!